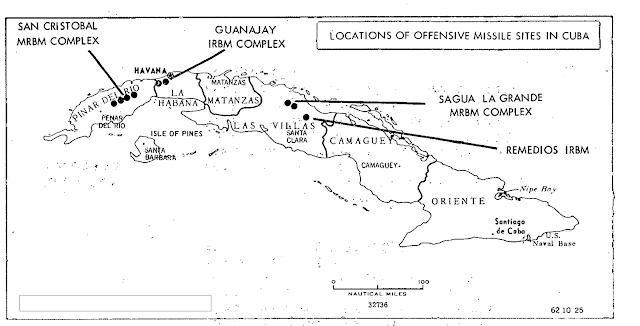 Brianroy's Input: October 1962 Cuban Missile Crisis President's Intelligence Notes We Legally Can See. Declassified And Sanitized CIA Intelligence Briefing Notes Released For Public Consumption As of July 2015. 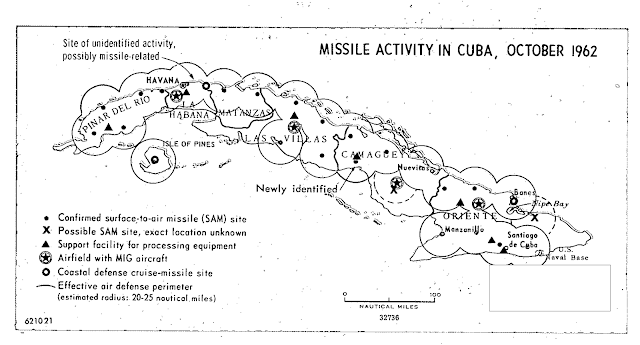 October 1962 Cuban Missile Crisis President's Intelligence Notes We Legally Can See. Declassified And Sanitized CIA Intelligence Briefing Notes Released For Public Consumption As of July 2015. 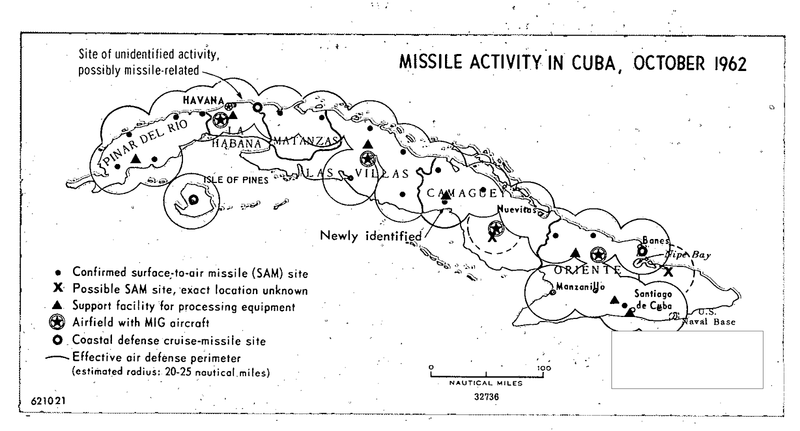 The Cuban Missile Crisis occurred during the days of Tuesday October 16 to Sunday October 28, 1962. Considering how that jackass Communists, Muslim sympathizers and Muslims. and Obama groupie sh*t for brainers on psychotropic drugs who strut around demanding hypersensitivity to their deviance and congenital idiocy relabeled as political correctness, and how they are pushing toward a nuclear confrontation with the Manchurian Compact of Russia and China at the Ukraine, at Syria, at the South China Sea, it is a necessary thing to know what the talking points of rationale would be and how they will spin this among themselves by looking at the past. If you do not understand the past, those who try to conquer you will use that ignorance to their advantage and encroach and infringe and conquer under the old maxim which says "Knowledge is power." The following is direct sanitized and declassified material for public consumption, and the *** and **** signs designate that words or whole sections of comments were deleted and sanitized as still classified, even after 53 years. a. Another surface-to-air missile site has been located. Villas provinces, brings the total of identified SAM sites to 22.
b. *** at least nine of these installations are probably now operational. c. There are *** IL-28 crates at San Julian in the extreme west of Cuba. The aircraft are being unpacked and one is well along in assembly. d. Cuban air force activity was stepping up rapidly late last week. at San Antonio de los Banos and Santa Clara. a. Fidel Castro is scheduled to go on the air later today, at a time still unannounced. decreed yesterday even before the President’s broadcast. a. Fidel Castro had little new to say last night. As expected, he rejected any proposal for international inspection of Cuban territory. readiness date at two MRBM sites back from 22 to 25 October. Photography also shows erection of camouflage nets under way at some sites. ships will not submit to blockade. a. There have been no surprises cropping up in the past 24 hours. 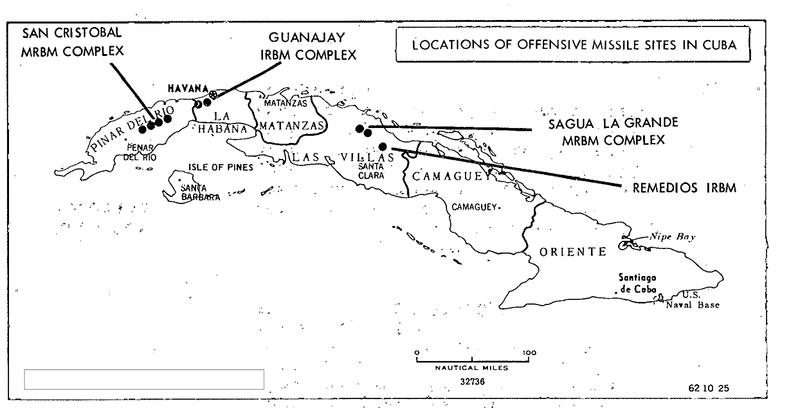 is none of the confusion that accompanied the mobilization in April 1961.
offensive weapons in Cuba and never using the word missile. a. We have noted no significant movement or deployment in any of the Bloc military forces. and filling northwest of the Azores. It may intend to make another submarine rendezvous. of the diversion of Soviet shipping. c. So far there has been no reaction to the President’s reply to U Thant. consultations last night with their governments." Bermuda. It has also stopped and boarded the Lebanese freighter, Marcula, inside the quarantine zone. a. Havana remains quiet, but the prevailing atmosphere is one of slowly rising tension. check-out operations in progress at two San Cristobal MRBM sites. Reactions in the non-Communist world are about what they were yesterday. notably in Europe, over the possibility that the Soviets will take retaliatory action. shown itself to be weak-kneed. ***"
Construction. Our estimate of operational readiness dates stands unchanged. c. Photography has also turned up a launcher for the “Frog” missile. Honest John. It can carry either a nuclear or conventional warhead. Apparently normal exercise activity is continuing in many of the major commands. The Soviet diplomatic drive for negotiations also continues. a. There has been no distinct shift in the pattern of reaction elsewhere. British public opinion to be with us. deciding whether there has been an easing of the crisis or not. and Caracas have been hit by demonstrations. ammunition for all services against the contingency of an all-out Communist effort. Embassy Caracas considers this request to be of the utmost urgency. " Saturday, we estimate that all 24 MRBM missile launchers are now fully operational. d. Camouflage against aerial photography is becoming more effective. 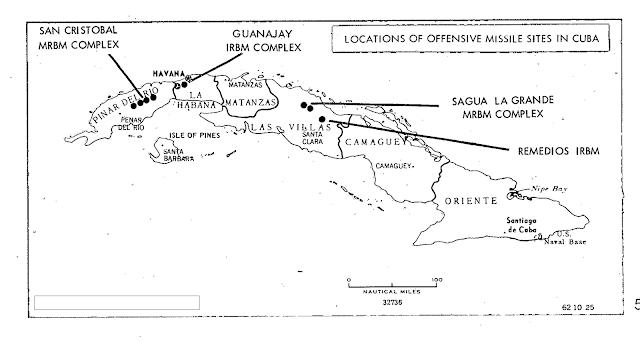 missile sites in the past few days. proposals for a settlement to sharp attacks on our turning them down. is one of no compromise. over the way things are going. Cuba from one hour to ten. of stiffer measures against Cuba. " a. We see Khrushchev’s Cuban misadventure as a major setback for him personally. c. There are no scapegoats for this one and he will be blamed by just about everyone. Many whom he has bullied are probably secretly pleased. last night, we suspect, to show their ranks are undivided. a. Castro faces a serious setback to his prestige. concessions from us before pulling the missiles out. So far the only endorsement he has gotten has come from Peiping. promise to dismantle the missile sites. reconnaissance to be intended to provide a pretext for procrastination. Moscow will continue to play the German problem in low key for the time being. the shambles by showing that the move averted unilateral US action. Moscow to postpone action on Berlin and a peace treaty. blockade of West Berlin in retaliation for the Cuban quarantine. Cuban crisis, but it will be bitter. information with China since 1959.
on another front – the India border dispute.